inside a supermarket and you’re surrounded by slogans, logos and competing claims clamouring for your attention. The average Australian supermarket carries 30,000 products. Apart from the fresh foods almost every one these comes in a packet, and those packets are covered with (often empty) promises. No added sugar, 98% fat-free, no preservatives, and on it goes. It can be hard to cut through all these claims work out the best choices. 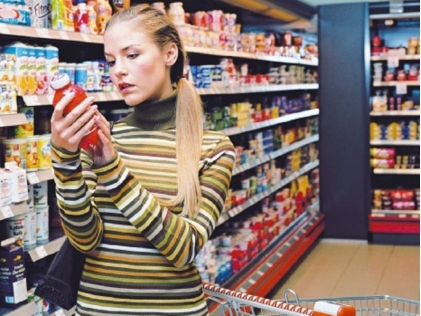 Examining food labels, decoding their information and making an informed assessment seems an over-whelming task, particularly when you’re pushed for time. But if you know where to look and how to interpret what you find, you can soon decide whether a food is right for you. All food labels are required by law to include an ingredients list, a nutrition panel, the product name, the weight, information for allergy sufferers, a use-by or best-before date, the country of origin and the contract address of the manufacturer or importer. Most of what’s left on the packet is marketing. In other words, it’s about making you choose that product over any other in the store. Packaging is one of the most important promotional tools a food manufacturer has. Knowing this means you should treat much of what’s on the packet with a healthy scepticism. The two most useful places to look for information are the list of ingredients and the nutrition information panel, since they contain unbiased, basic facts. I scan the list of ingredients to gain a quick sense of the quality of the food. It shows everything that’s gone into making the product, and all the ingredient must be listed in descending order by weight (that is, from most to least). So, if rolled oats are the first on the list, they are the primary ingredient. How long is it? The more ingredients a product has, the more processed it tends to be. Some have ingredients lists centimetres long written in a tiny font. These are generally heavily processed. Do I know the words? Check to see if the ingredients are easily recognizable as foods, or if they sound more like laboratory substances. Does it contain what I think it should? It’s common to find products that are bulked out with cheaper ingredients – “avocado dip” with less than 10% avocado, for example. Or “fruit muesli” that contains juice instead of actual fruit. Packaged foods also have a nutritional information panel. Think of it this way: the list of ingredients shows what’s in the food; the nutrition information panel shows you how good (or bad) it is for you. You can use it to check which products are high in sodium (salt), or compare kilo joules between different foods. It’s important to compare like with like, and it’s easier to do so by reading the part of the panel that lists information “per 100g”, rather than per serve. There are no standard serving sizes, so they can be manipulated to make one product look superior to its rivals, or to make an unhealthy product sound better. You may find a dessert, for example, that sounds promisingly low in fat – until you notice that the one small package you’d think serve supposedly contains ten. Use the table (far left) to see what’s a little when it comes to nutrients. And take your time: many manufacturers now have ingredients lists and nutrition information panels on their websites, so you cam make comparisons from your desk, rather than trying to do it while rushing around doing the weekly shop. Lite, light, fat-free and low-fat: of these, only “free-fat” and “low-fat” have legal definitions. 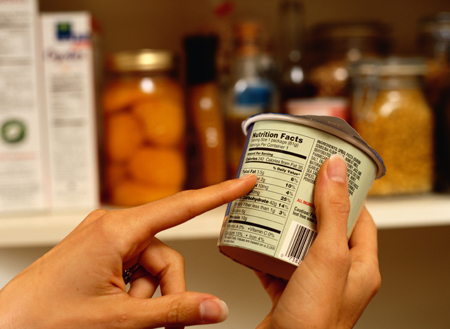 Fat-free products must have less than 0.15% fat, while low-fat foods have no more than 3% fat. Products are also allowed to be described as “X% fat-free,” but remember that while a product advertised as “93% fat-free” may sound good, it actually contains 7% fat-and that is not considered a low-fat food. “Reduced fat” means very little, and “lite/light” can just as easily refer to the colour and taste of a food as to its kilo joule or fat content. Ever wondered how it’s possible for a packaged product on a shelf to be fresh or home-made? Along with pure, gourmet and premium, these terms are used to hint that the food has a special quality, making it better than their competitors. But they’re just marketing words with no specific meaning. Ignore them. Manufacturers aren’t allowed to use the word “health” when describing their food product, but it doesn’t stop them using dubious related description, like “rich in energy”, “food for your baby” and “high in dietary fibre to keep your body in shape.” These emotive terms don’t mean much. Again, ignore them and read the nutrition information panel instead. Foods described as “natural” definitely sound healthier and more wholesome. But the key word is sound. While there are guidelines, there is no legal definition for use hjof the word “natural”, allowing it to be slapped on products that may still be highly processed, or full of preservatives, colours or trans fats. So pay no attention to “natural” claims. Ever bought food based on the sumptuous photo on the box, only to be disappointed when you open it up? We all have. Packaging images require a team of stylists and shooters and still get photoshopped. Buyer beware.